GF Yummies for You - Gluten Free Creations, Inc.
3. 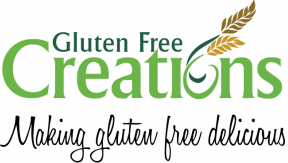 Email Lydia at lydia@glutenfreecreationsinc.com. Click on the following link for your Holiday and Party Trays order form. Complete it and email it to us or call us with your order. To make sure you are receiving the most up to date information, please "Like" us on facebook. I would love to be a part of your wedding day! I provide a complimentary tasting for two people ($10 per additional person). Tastings are by appointment only. To set up your tasting, call Lydia Armstrong, owner, at 317-270-4175. Wedding cakes are specifically priced per customer's needs. A signed contract and down payment and/or full payment is also required. Yeast - (All soy, peanut and tree nut free) Whole Grain Sandwich Bread (dairy free or vegan), Whole Grain Sandwich Bread w/Teff Flour blend (dairy free or vegan), Whole Grain Cinnamon Raisin Bread, Rosemary Focaccia, Garlic Parmesan, Sandwich Rolls, and Dinner Rolls. Pumpkin w/Pecans, Zucchini w/Pecans, and Zucchini. Snickerdoodle, and White Chocolate Chip w/Macadamia Nuts. ​Cookie Cakes: Call for pricing.